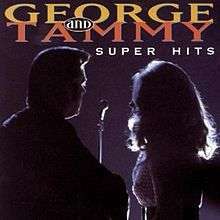 George and Tammy Super Hits is an album by American country music artists George Jones and Tammy Wynette released on May 2, 1995 on the Epic Records. This article is issued from Wikipedia - version of the 12/18/2014. The text is available under the Creative Commons Attribution/Share Alike but additional terms may apply for the media files.